The donkeys are first cleaned and caressed. You will learn about the attitude, feeding, care and the special features of the long jackass. As well as the differences between donkey and horse. During the walk with the animals each child will be able to ride once. We sing songs, maybe play a game, draw / tinker something or hear a story in the haystack. On the fire we make baked bread, somepopcorn and eat together the picnic brought along. - To take along: we recommend good shoes and weather-adapted clothing. If you like you may bring the bicycle helmet of the kids with you, but we also have some riding helmets here. 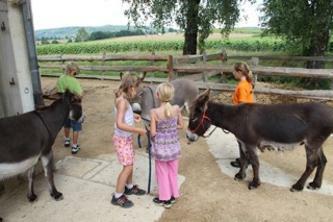 The children learn to know the donkeys and clean them together with a parent or a companion. We caress and cuddle with the jackass and take a short walk, where every child can ride. 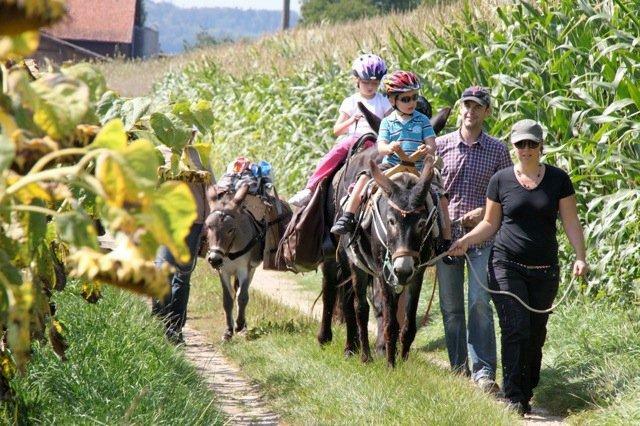 We learn playfully about the nature and the needs and the appropriate attitude of the donkey. In the Haystack we sing a song or hear a story. We look at the stable, smell the hay, maybe make a game and eat our food together. You will get to know the jackass closely. After we have tyed up all the animals, we linger with grooming, stroking and cuddling the long ears. You learn how to clean an donkey properly and scrape hooves and at the same time you will learn about these lovable long ears. In the second part, you can lead the donkeys in the enclosure through a self-made parcour, or you can sit on a tied donkey. Would you like to be brave and have a chicken peck out of your hand? What do turtles like to eat? Do you know the smallest sheep in the world? 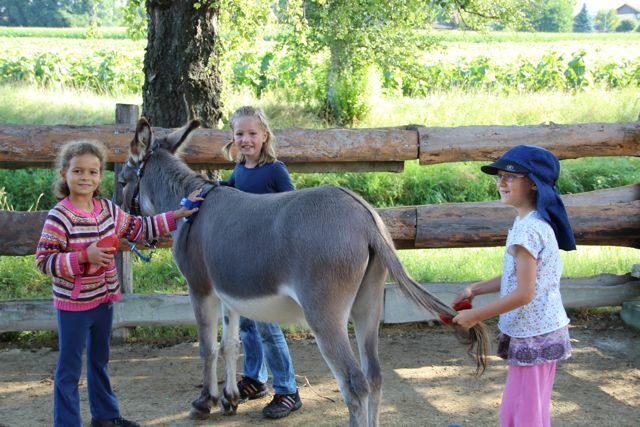 You learn to know closely the different animals on the donkey farm. We will visit the various animal species, learn about keeping and care, feel the different "clothes" of the animals and feed them out of their hands. 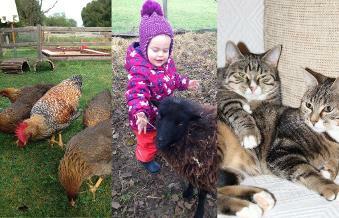 Perhaps we meet cats on the way or we notice which small animals and insects also live on our farm.